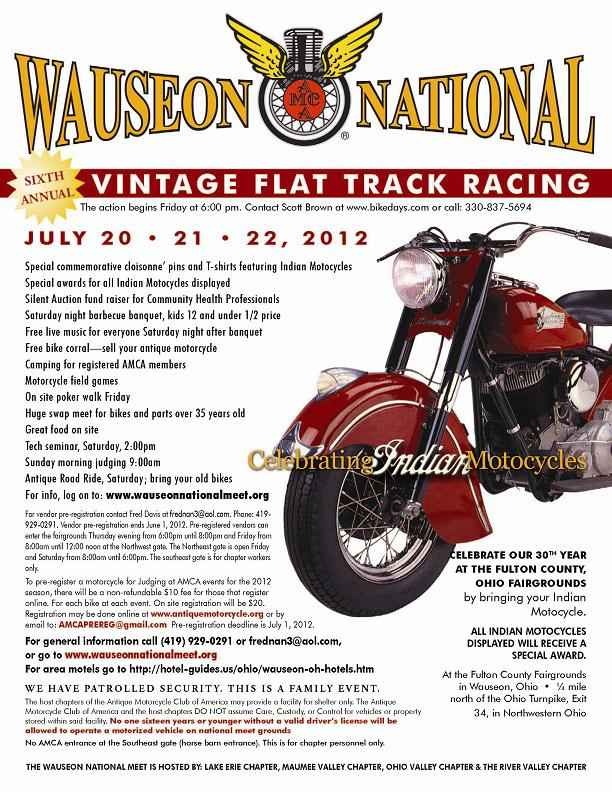 In six quick years, the Wauseon National Classic Flat Track Half Mile Race, and the accompanying AMCA National Meet, has become the place to be, if you are into vintage and antique motorcycle races. 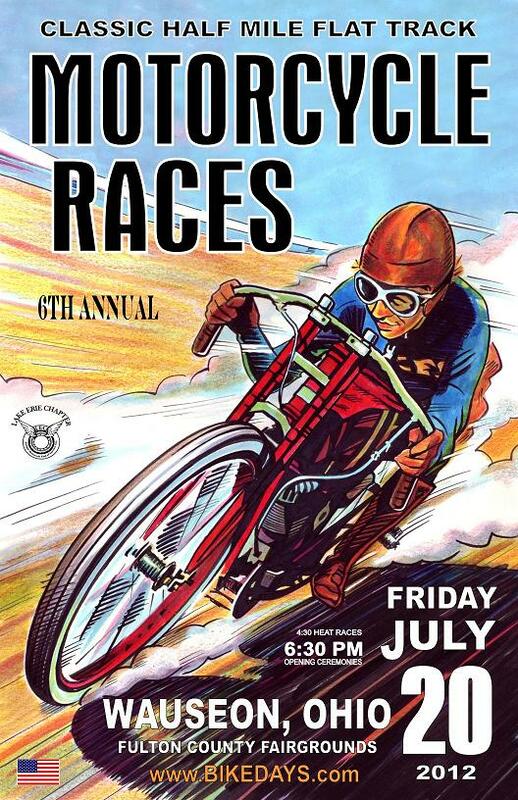 155 riders brought their rare and valuable bikes to compete with each other in ten different classes, ranging from 100 year old board trackers to 70's and 80's twins and singles. And if that weren't enough, the event also featured a Speedway Long Track National event! The Wauseon race is now only rivaled in size by the Davenport, IA race held in September at the Chief Black Hawk Meet. And they are both part of the Classic Flat Track National Championship Series that also holds races in Elkhorn, Wisconsin and Knoxville, Iowa. When racing started, twelve ancient board trackers were topped by Carl Estes, of Loveland Park, OH on his 1929 HD. Then George Wills won the Handshift class on his '51 HD, topping two-time Wauseon winner Doug Horner and his Indian Sport Scout and a field of 11 foot-clutch hand-shifters. George Roeder II rode a Kelly George built, Indian Chief in this race, but graciously passed the victory flag on to Wills. The most-entered class and probably the most exciting races of the night were put on by the vintage twins (thru 1983) class with 35 riders. It took four heats and two last chance qualifiers to set up a three-row 18 bike main event, including such riders as George Roeder II, Chad Rall, and 71 year-old "On Any Sunday" rider Jack Warren. Warren then overcame a penalty line start to win a thrilling race over the two "big names" Roeder and Rall. Roeder and Rall later competed in their annual Wauseon "grudge match," with Rall coming out the victor this year when Roeder's Norton failed. The score is now tied, with Roeder winning in 2011, and Rall in 2012. The crowd really enjoyed the high-speed, dirt flying National Speedway events with Dan Weicht topping such names as John Debats, Chad Rall, Chris Hathaway and Ohio's patriarch rider, Ronnie Rall. The senior Rall had both knees replaced just six months ago. I asked him if he should be risking them so soon and he said "Why not? I put up 1500 bales of hay yesterday and that didn't hurt too much." Sponsors of the race are: Oury Grip, PJ's Fabrication, Spectro Oils, Wiseco. Pre-Entry Deadline: June 15, 2012 (postmarked) Sorry no refunds or cancellations. Event T-Shirts: Each rider that pre-registers by June 15, 2012 (postmarked) will receive one FREE Bike Days t-shirt. Awards – Checkered flag to first place winners and plaques awarded to second and third finishing positions.